Dr. Lester Grinspoon, associate professor emeritus of Psychiatry at Harvard Medical School, recalls exploring the cosmos with a little help from cannabis, and his best friend Carl. A simple request. Via Neverco. Dr. Lester Grinspoon's interest in marijuana dates back to 1967, the year he decided to research the subject sufficiently enough to convince his best friend—who just happened to be Carl Sagan—and a few other associates to stop smoking the stuff. While the internationally renowned astronomer never publicly acknowledged his use of cannabis, the bestselling author and host of "Cosmos" did partake frequently and enthusiastically in private, invariably encouraging his straight-laced companion Lester to join in. Instead, Dr. Grinspoon began to visit the Harvard Medical School library, prepared to spend as much time as necessary putting together a well-referenced argument against grass, one that would demonstrate a medical and scientific basis for the plant's prohibition. Instead of finding the hard data he'd expected, however, Grinspoon had an epiphany—he'd been brainwashed about marijuana, as had just about every other citizen in the United States. Four years later, despite facing pressure at Harvard not to touch the subject, Grinspoon published Marihuana Reconsidered (1971) to document his findings. The bestselling book described, among other things, a decades-long government propaganda campaign undertaken to keep marijuana illegal at all costs. I do not consider myself a religious person in the usual sense, but there is a religious aspect to some highs. The heightened sensitivity in all areas gives me a feeling of communion with my surroundings, both animate and inanimate. Sometimes a kind of existential perception of the absurd comes over me and I see with awful certainty the hypocrises and posturing of myself and my fellow men. And at other times, there is a different sense of the absurd, a playful and whimsical awareness. Both of these senses of the absurd can be communicated, and some of the most rewarding highs I've had have been in sharing talk and perceptions and humor. Cannabis brings us an awareness that we spend a lifetime being trained to overlook and forget and put out of our minds. There is a myth about such highs: the user has an illusion of great insight, but it does not survive scrutiny in the morning. I am convinced that this is an error, and that the devastating insights achieved when high are real insights; the main problem is putting these insights in a form acceptable to the quite different self that we are when we're down the next day. Some of the hardest work I've ever done has been to put such insights down on tape or in writing. The problem is that ten even more interesting ideas or images have to be lost in the effort of recording one. Toward the end of his life, without disclosing his own use, Sagan started advocating for medical marijuana. Three years after Sagan's death, Dr. Grinspoon decided to posthumously reveal the identity of Mr. X in interviews with William Poundstone for the latter's Carl Sagan: A Life in the Cosmos (1999). Grinspoon's decision was based on the world famous scientist's oft expressed wish to aid the movement to end marijuana prohibition. Grinspoon, meanwhile, has dedicated much of his life and work as a physician, professor, author, advocate, and activist to investigating cannabis's amazing medical properties, and fighting for the kind of historic marijuana legalization that's currently taking root in Colorado and Washington. He spoke with me from his home in Massachusetts. MOTHERBOARD: Do you remember the first time you met Carl Sagan? Grinspoon: I sure do. I had a professor at Harvard Medical School who lived alone in a big house with his own chef. He was kind of an intellectual lighthouse—very actively involved in liberal, progressive political movements. And his Friday night dinners were legendary. Usually a group of about 30 people representing not just the medical school, but all the different departments at Harvard. At one of these dinners in 1965, we got into discussing the Vietnam War, which was beginning to escalate. Well, everybody at this big party supported US involvement, except for Carl Sagan and myself. Pretty soon, Carl and I were virtually backed into a corner. So afterward, we introduced ourselves and in a very short time became close friends, which we remained until the day he died. I was best man at his wedding. Carl, by the way, stayed extremely active in opposing the war. He possibly didn't get tenure at Harvard because of his outspokenness. When did you discover that he enjoyed smoking pot? My wife Betsy and I went to a party with Carl not long after we met, and it quickly became clear that marijuana was a regular feature of social life within his little circle in Cambridge. As a physician, I saw all that smoking going on, and I was really concerned about it. I suffered from a kind of arrogance that sometimes afflicts physicians. Doctors are supposed to automatically be experts on drugs, and so I found myself spieling off the stuff that the government was saying, telling this wonderful group of people that I was concerned about marijuana's detrimental effect on their health. Because I truly believed pot was a very harmful drug. I actually succeeded in getting two or three of them to at least temporarily reconsider. But whenever I'd say as much to Carl, he'd wave the joint in front of me, and reply, "Oh Lester, have a puff, it's not going to hurt you a bit and you'll love it." Doctors are supposed to automatically be experts on drugs, and so I found myself spieling off the stuff that the government was saying... But whenever I'd say as much to Carl, he'd wave the joint in front of me, and reply, "Oh Lester, have a puff, it's not going to hurt you a bit and you'll love it." Did he have a scientific basis for thinking marijuana was relatively safe? No, he was just instinctually distrustful of the government's claims when compared to his own observations. How did he react when you wrote a book proving him right? Carl and I used to review each other's manuscripts before they were published. When he read Marihuana Reconsidered, he said, "That's a wonderful book, but you made one big mistake. You said in the last chapter that marijuana prohibition will end within ten years. But it's going to be gone in two years. It just can't survive any longer than that!" Was he high when he made that prediction? I don't think so [laughs]. Anyway, he stuck with that time table for awhile. We actually discussed it once, many years later, when I began to fear that I'd never see legalization in my own lifetime. How long did it take him to get you to try cannabis for yourself? As I researched and wrote about marijuana, I knew I wanted to have this experience, but I also knew that if the book was successful, I'd be called upon to appear before committees and testify in court, and I didn't want to compromise my position. In other words, I didn't want this to become a N-of-1 study. I wanted to be as objective as possible. So I waited. Then, about a year and a half after the book came out, I had to testify before a state senate committee in Massachusetts. And one of the senators, who was clearly hostile to my position, asked, "Have you, Dr. Grinspoon, ever used marijuana yourself?" To which, without planning it, I replied, "Senator, I'll be glad to answer that question if you can tell me whether if I answer in the affirmative, that would make me a more or less credible witness." Well, the senator stood up on the dais, pointed an accusing finger at me and declared, "Sir, you are being impertinent." Then he stormed off. So I went home to my wife and said, "Betsy, the time has come. We're going to smoke." Ever since Marihuana Reconsidered came out people had been asking me: "Wait, you wrote a book about marijuana and you've never tried it?" And I'd reply, "Well, I wrote a book about schizophrenia too, and I haven't tried that!" But then that very night, we went to a party and smoked until everyone else in the circle, including Carl, waved it off. They were all apparently stoned, while Betsy and I felt nothing. At which point, I began to get very anxious—could I have written a book about a grand placebo? When I got home, I couldn't sleep. Betsy had to remind me that my own research revealed many people don't get high the first time they smoke. Carl, in his Mr. X essay, said he'd had to try something like six times to experience a high. We went to a party and smoked until everyone else in the circle, including Carl, waved it off. They were all apparently stoned, while Betsy and I felt nothing. At which point, I began to get very anxious—could I have written a book about a grand placebo? So the next weekend we smoked again, and it still didn't work. But then the third time, I remember after the joint Betsy and I were standing around with another couple in the kitchen, eating a napoleon—the four of us passing it around. And you know that viscous material between the layers? It kept sliding back and forth threatening to fall on the floor. We were having a hilarious time! So Betsy asked, "Where did you get this napoleon, it's unbelievably good. We've never had anything like it." And when they named the bakery, we were surprised to discover we'd eaten their napoleons before! Meanwhile, Sergeant Peppers Lonely Hearts Club Band was on the hi-fi, a record I'd actually heard before many times. My son David would put it on and say, "Dad, you ought to get your head out of the Baroque and listen to the Beatles." But I didn't see the appeal. Until that night, under the influence of marijuana, when I heard the Beatles for the first time. And it was like an auditory implosion. I couldn't believe it. What was Carl Sagan like when high? He was the same wonderful person, only definitely more relaxed. He had a great sense of humor, which really came out. He loved to smoke a joint before we went out to dinner, to stimulate his appetite. And he was always eloquent—could speak spontaneously like no other person I've ever known. We always had fun when we got stoned, and we had such wonderful discussions. It was exciting to smoke with Carl. He was also the hardest working individual I've ever met. When people try to say that marijuana will make you less productive, or lazy, and so forth, I always think of him. He was constantly working, in a sense. Using marijuana as a creative stimulant. He felt he got more ideas while stoned, and also understood that you have to reevaluate them when you're not stoned. I observed him using that method a lot. One time, Carl and his wife were visiting us on Cape Cod. I was taking their son out fishing, and Carl wanted to stay behind and walk around a lonely beach at low tide. Well, I could see from the boat that he was having a smoke, and then he just started pacing along talking into his brand new voice recorder. Before that, he used to jot a note on the back of an envelope. Anything to get his stoned thoughts down, so he could review them at a later time. Sagan chats with two Centers for Disease Control employees, 1988, via Wikimedia Commons. That he found cannabis so very useful in his work was really a lesson to me. In time, I learned to use it the same way. Especially when I could get my hands on the good stuff. I would get these gifts of marijuana occasionally from California, always completely anonymously. Some kind souls would put a dozen joints or a baggie of weed in a small cardboard box, then stuff it with newspaper and add a stone to give it weight. One night my wife and I were going to meet Carl and his wife for dinner, and I brought along two joints of some brand new stuff I'd gotten called sinsemillia. Well, Carl just loved it. At the end of the night, he knew I'd brought two joints and we'd only smoked one of them, so he said, "Lester, I hate to do this, but could I ask you to give me that second joint? I have to finish writing a chapter tomorrow, and I'd love to have that." So naturally I gave it to him. That was the moment I began to realize that in addition to medicine and recreation, cannabis can benefit people through enhancement of certain human potentials. Was all this pot smoking sort of an open secret? Not at all. This was a very small group of people. Carl would never light up unless he knew everybody in the room. As much as he loved marijuana, he was always very concerned about people finding out. For instance, one of the early pieces I wrote on the subject appeared in The New York Times Magazine, and in it I said something to the effect, "People have the idea that only these hirsute young hippie kids use marijuana, but in fact a lot of ordinary and even extraordinary people smoke it, including professionals." Then I mentioned doctors, lawyers, etc. Well, in that list I included astronomers. And when that came out, it was the only time Carl ever expressed any anger towards me. Because he thought mentioning astronomers would give him away based on our friendship. Another time, we went on a cruise to the South Pacific to see Halley's Comet. I smuggled about an ounce of marijuana on board, and we had a wonderful time. Carl had the top cabin on the ship, including a deck where we could sit and smoke and talk and eat—for hours on end—while watching the beautiful cloud formations over the Pacific. When the cruise was over, we still had some marijuana left. I didn't want to go through Customs with it, so I told Carl that I was going to toss it down a companionway I had noticed was marked "Crew Only," trusting that it would be enjoyed among the mates. But he asked me not to, because we might somehow be found out. So we weighed the baggie down with one of those old glass ashtrays, and tossed it overboard. I hated to let this precious stuff go down to the bottom of the sea, and didn't really see how we could ever have gotten caught passing it along, but I had to respect Carl's objection. Really, it was very important that he not get in trouble. He was testifying before NASA and Congressional committees all the time. 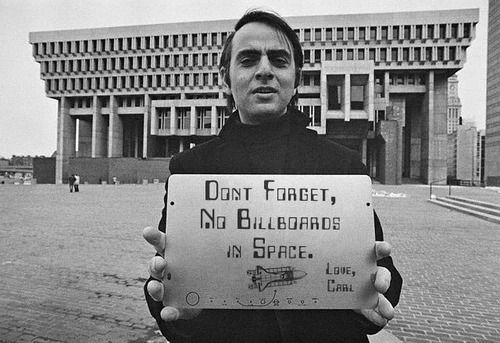 In fact, I miss him so much right now not just personally, but also because I'm so worried about global climate change, and I think, "Boy, if Carl were around, this would be his issue. He could get people together and help them understand what a tremendous threat we face." How did the bud in the 1970s compare to what's around now? Oh, well, the stuff that's available now—we'd have loved to have some of that way back when. Carl especially would have enjoyed Dr. Grinspoon, the strain named after me, because it's a very heady high (25 percent THC). Which is just the kind he liked. I think there's nothing he'd love more. After consultation with Valerie Corral of the Wo/men's Alliance for Medical Marijuana in Santa Cruz, California, the groundbreaking, "gold-standard" collective will soon offer a new strain—Cosmos—named in honor of Carl Sagan. It's an appropriately spacey sativa variety offering strong cerebral effects and serious appetite stimulation. Is Weed Getting Too Good?